Indie Retro News: DDI3 USB Floppy Emulator for the Amstrad CPC 464 BIG Review! 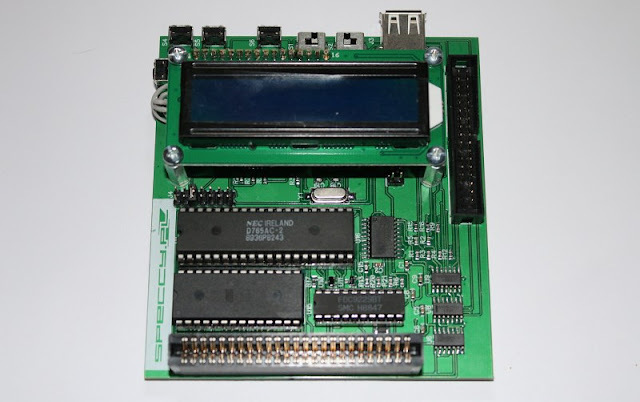 DDI3 USB Floppy Emulator for the Amstrad CPC 464 BIG Review! 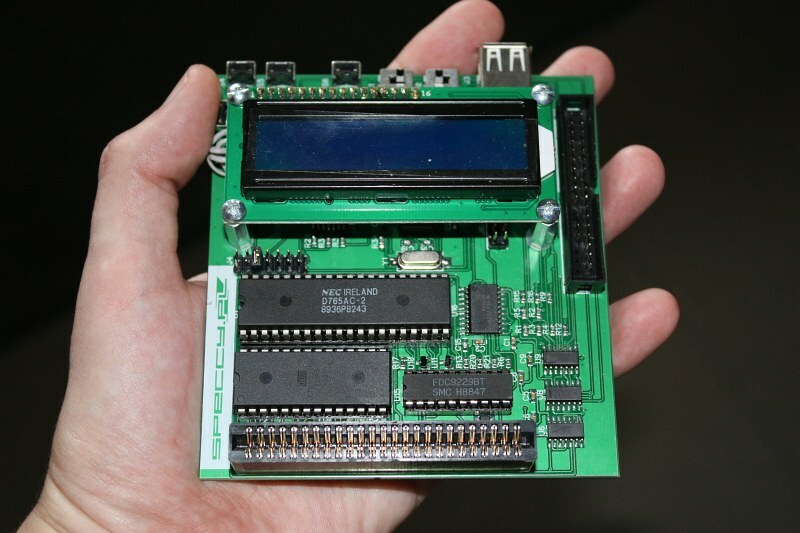 When Indie Retro News began its life some years ago, most of our hardware reviews have either been for the C64 or specific Everdrives for retro based consoles such as the Sega Mega Drive and NES. However we have never done a review of anything for the Amstrad CPC 464 or 6128 because at the time there were no new external SD attachments specific for that hardware, at least until now. 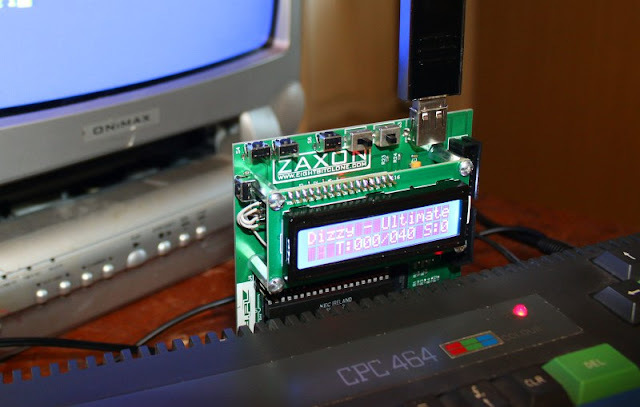 This is the 'DDI3 USB Floppy Emulator for the Amstrad CPC 464' by a rather talented designer by the name of Zaxon also known as Piotr Bugaj, who has created some impressive pieces of kit for systems such as this Amstrad and even the ZX Spectrum! Before I begin with this review here's a bit of information about the device above, now some of you may ask me this, but what is the point of the DDI3 USB Floppy Emulator for the Amstrad CPC 464 if you can buy the original HxC and use that for playing games. 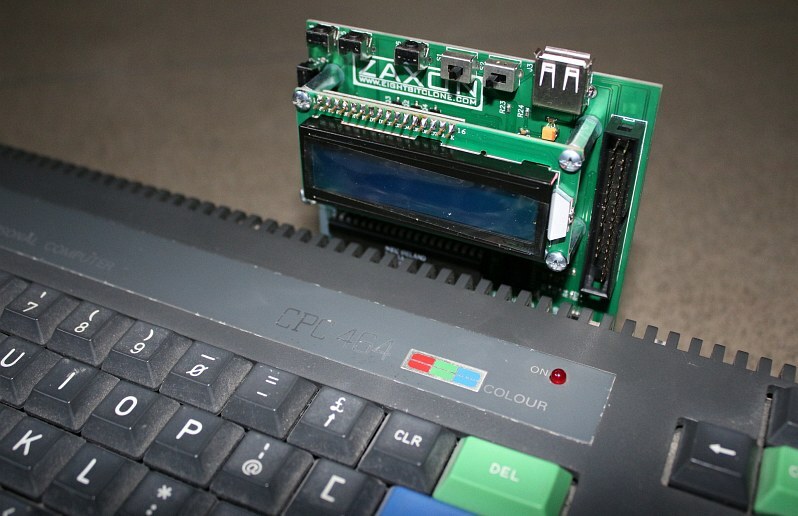 Well it's not that simple, the problem is the HxC isn't specific for the Amstrad CPC 464, so you will still need to find a device called the DDI-1 which plugs into the back of the 464 and controls the FD-1, or shall I say the HxC. Oh and not forgetting the floppy cable, switches and power cable requirements. 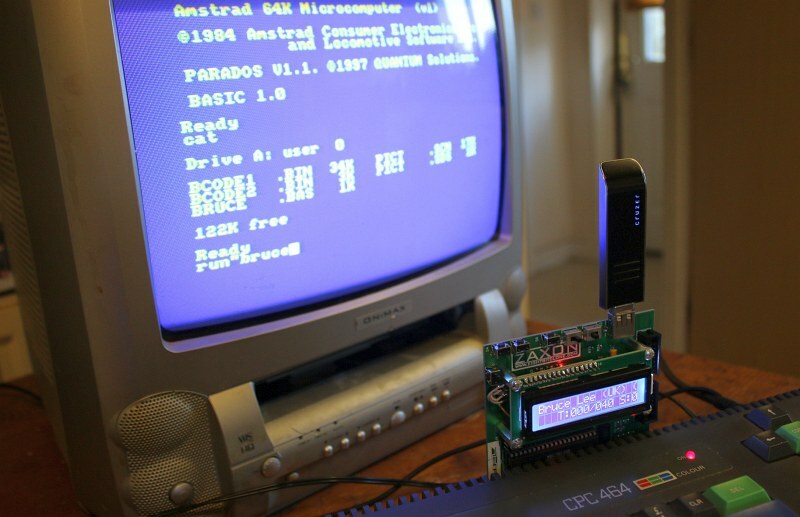 ( Amstrad CPC 6128 doesn't need a DDI attachment ). And so this is where the DDI3 USB Floppy Emulator for the Amstrad CPC 464 comes into its own, as it's not just a DDI interface integrated with USB floppy emulator on one board, but there is no need for an external power supply and you can attach another external floppy if you so wish. Other such additions include, Parados and AMS Dos on board changeable by switch, a clear LCD display, USB Memory Stick slot for demos and games, slot selections and all this working under HXC firmware ( Gotek anyone? ). This device is also what I'd class as a chunky bit of kit, it certainly has some weight to it and as you can see in my hand, it's not the smallest of devices, although it does not give the impression of being cheap nor will it break in your hands, unless of course you like throwing things on the floor. Now here's where I come to my first negative, no instructions!! Even if it looks like it could be worth hundreds of pounds ( It's not ) it still has a lot of buttons and connections that even if it's explained online, still needs to be shown in a diagram on a piece of paper. This also comes in handy if you ever need to sell it on in the years to come. Moving on to the modern attachment, this was easy enough, just find the back of your Amstrad CPC 464, look towards the slot closest to the tape deck and push it on, it really is that simple as there's no wires, something the C64 and ZX Spectrum have had the luxury of for some time. Yes there are original extensions you can buy such as memory accessories, but we are talking about something new and special here! But this is where the fun begins, turning it all on. The first thing to greet you when you power the old girl up, is a clear front LCD display showing ' USB HxC Floppy Emulator ' and then ' No USB Stick Found ', which was pretty obvious to me as I hadn't plugged one in yet, I just wanted to give it a quick power up. Pretty much any USB memory stick will do, although I'd recommend small in build but large in size, 4GB would be recommended and can be purchased very cheaply. Here's another feature showing up on the TV screen, which is built into the DDI3 USB Floppy Emulator for the Amstrad CPC 464, Parados v.1.1. 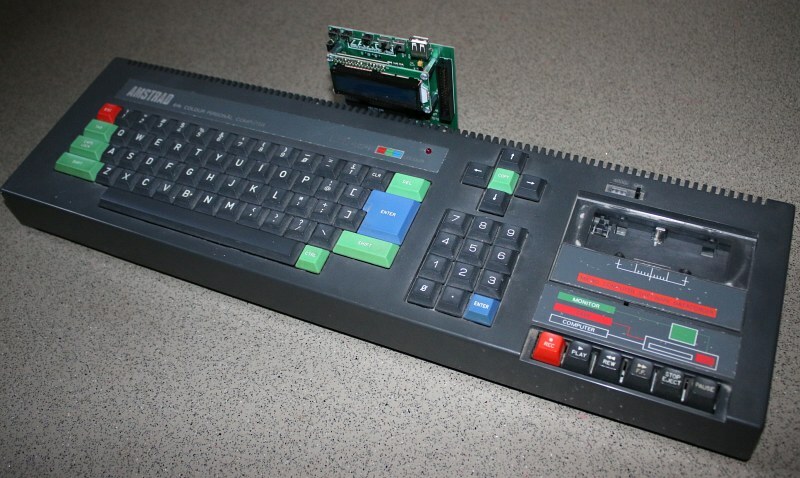 A 16kB ROM that replaces the AmsDOS which allows the Amstrad to use double-sided floppy disks and some more disk formats. It also has other features too, but more information can be found on the great CPCWiki guide. Next up I decided to load some games onto the USB Memory stick and this is when things began to get more tricky, more so if you no nothing about the HxC. 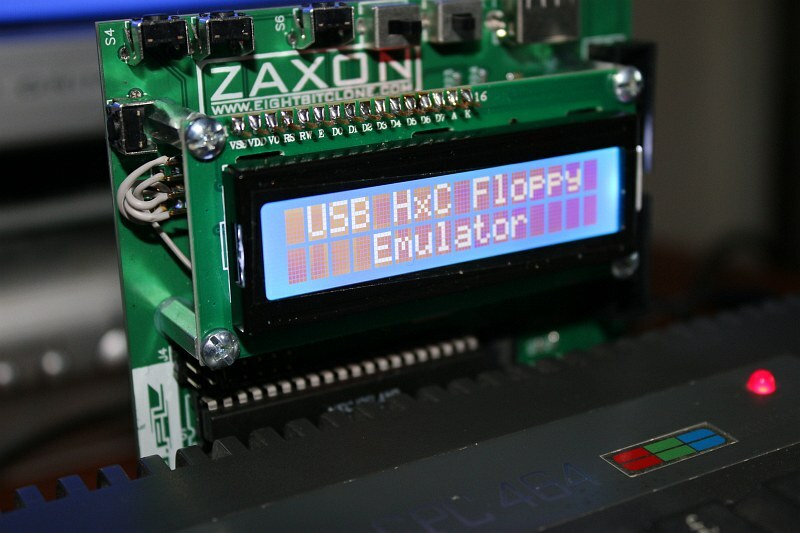 Although it does say on the store page, 'Floppy emulator support HFE format for now, so DSK files need to be converted to HFE', it doesn't say how, nor does it say where to get this conversion software, which again would've been good in a guide on the store page or instruction paper. 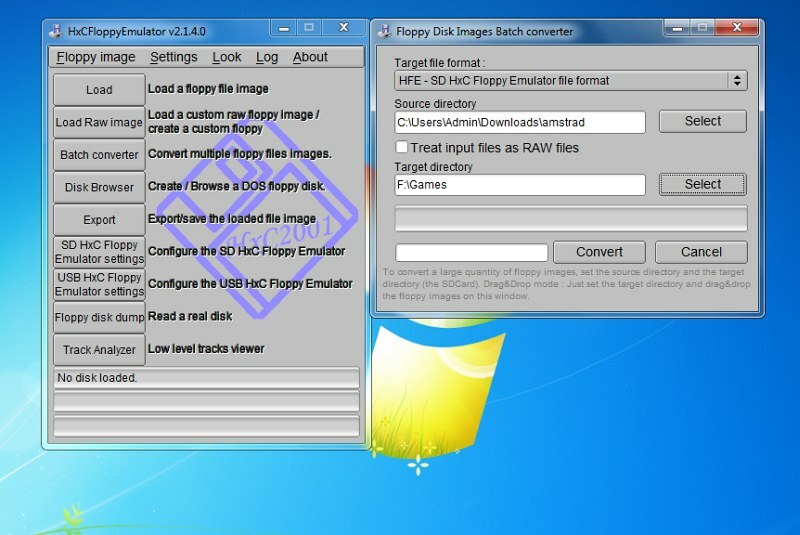 Thankfully as I knew the HxC, you needed to download the HxCFloppyEmulator V2.1.4.0 HERE and use that to batch convert your source directory of *.DSK images over to a target directory Memory Stick. Amstrad disk files/roms games can easily be found on the internet, or ask the members of the CPCWiki forums. 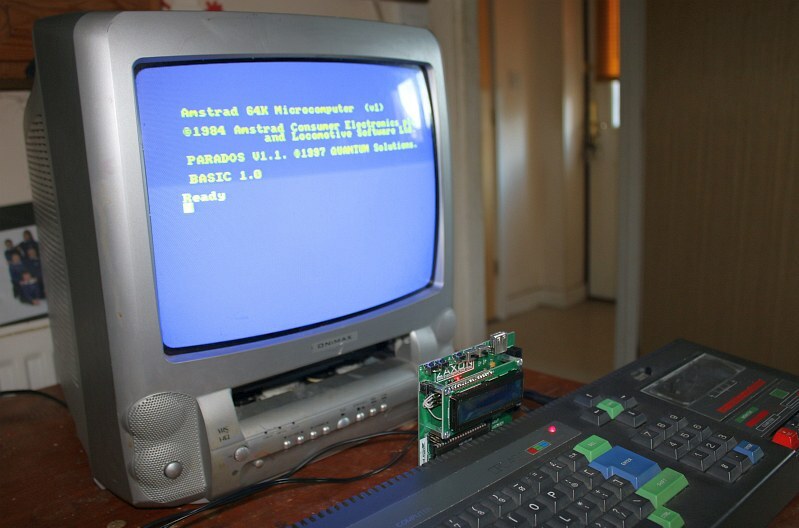 Placing the USB Memory Stick back into the slot and turning the Amstrad back on, we ran into our first problem. It kept on complaining about a missing HXCSDFE.CFG file. See the thing is, we as reviewers have to look at it from a perspective of someone who knows nothing about the HxC and also what we come across trying to be a simplistic as possible, plug in and play. 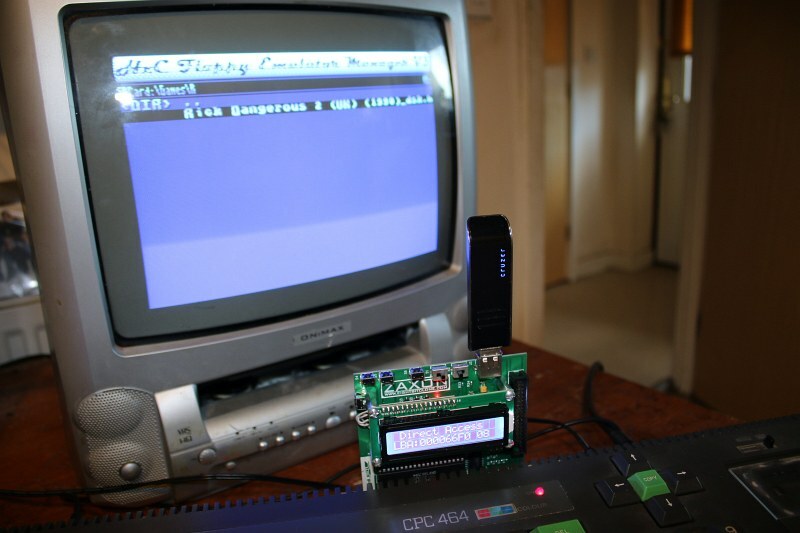 Now if you've ever purchased an SD2IEC for the C64 or even the C64 Monosoft Princess, it has a guide and also tells you to just unpack a provided zip with a teaser of games to the C64 device, run a specific command and away you go. See how beautiful it looks now! This time it loaded up perfectly with the LCD showing the current game in selection, however as there was no diagram instructions pointing to what each button did, even though I kinda guessed, I headed over to the store page and watched the provided video, which showed that the button on the left is the reset switch, the top left buttons are slot selections, the next button is the selection option and finally the other two switches are DOS switchers. By using the slot selections I scrolled through my directories A - C, used the selector button to pick B, then the selector button to pick Bruce Lee and the game was ready to be loaded up via the device and the Amstrad. All I needed to do now was the usual commands on the keyboard of CAT then Run"Bruce, and away it went. In just a few moments I was straight into Bruce Lee, with all it's glorious sound. As for other disk games, by unselecting the disk, moving onto the next and selecting that, you can play a game with more disks. It really is that simple and damn does it look good! But wait I wanted more, as this is HXC firmware after all! Can you use the HxC Floppy Emulator Manager downloadable from HERE, which gives the user a beautiful on screen UI with selectable directories, with each game saved to it's own slot just like on the HxC via the Amstrad CPC 6128? YES YOU CAN! 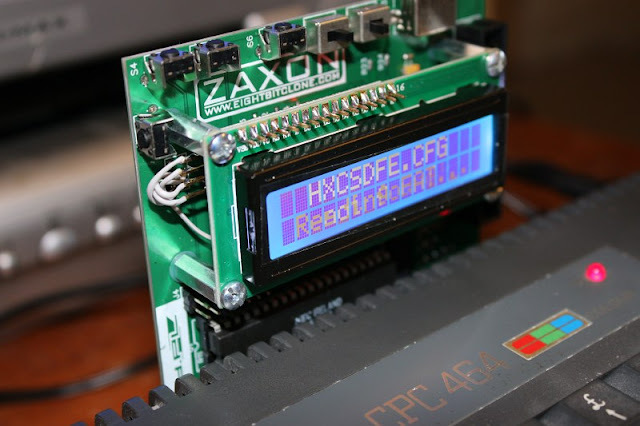 This is in fact a better way to do it, although you can still use the old method of game scrolling via the LCD if you want, using the HxC Floppy Emulator Manager makes all of this a breeze. Not only does unpacking the files from inside the Amstrad directory of the manager to the USB Memory Stick avoid all that faffing about above, copying over config files. But by simply typing Run"HxC on your Amstrad CPC 464 when the Autoboot LCD is showing, you'll be greeted to this amazing UI. A UI that shows all of your directories, that you can scroll through, with each disk contained within ready to be saved to a slot all viewable full screen on your TV. But as a BIG +1 to the LCD screen, without it, you'll have to change over to each slot in ParaDOS, then press CAT to remember which game is in which slot, the LCD helps with all of this, just beautiful! So finally after probably one of my biggest reviews and my most eagerly awaited devices, not since the 1541 Ultimate on the C64. Is this worth the £52.99 that it is being sold for? In a word YES! 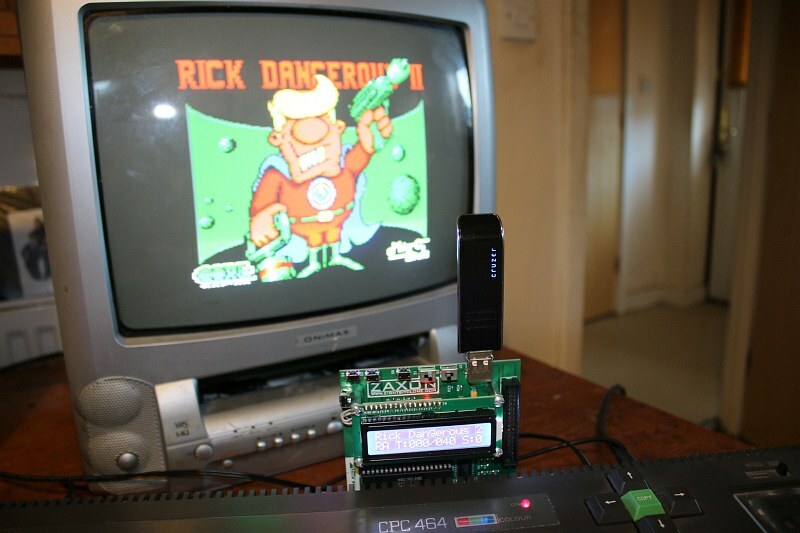 Not only does it take out the need for a DDI-1, it removes the need for a floppy cable, you can use a USB Memory Stick to play thousands of Amstrad games, you can view all of these games through the LCD and run them with a simple press of a button and a command type, and apart from it having ParaDOS on board, it looks sleek and it's built like a brick at the fraction of the cost of a full HxC kit and extras. But there is a negative though and it's not the device itself. That is the need for a picture diagram with instructions with the item showing you what button does what, how you actually convert the games and the need for the HxC files such as the HXCSDFE.CFG mentioned above. Perhaps this comes with the retail product and not my one, however for people less savvy on the HxC I think this would be a great addition. 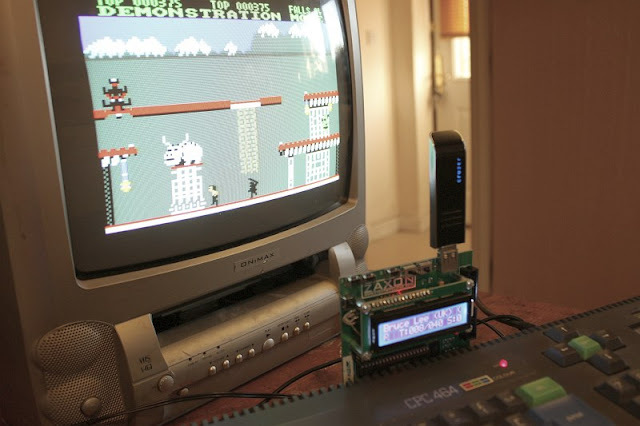 For what you are getting though, you really can't ask for anything more for the Amstrad CPC 464 for playing games through a memory stick. I'd highly recommend heading on over to the store page and picking one up, and also to talk to Piotr on Facebook if you have any concerns or want to know about other incredible hardware he has for sale. - A huge thanks to Zaxon/Piotr Bugaj for providing the DDI3 USB Floppy Emulator for the Amstrad CPC 464 for this review and we also hope to review the Amstrad CPC 6128 USB floppy emulator as well in the future.